Questions inevitably come up. We hope this fairly inclusive list of FAQ’s helps you find the information you need. If you do not find an answer to your question, please chat with us online or call us at 1-800-883-8281 or 516-506-7718, and ask to speak with Customer Service. Office hours are Monday through Saturday, 9 am – 6 pm. We have listed FAQs for Shipping, Rentals, and Storage. Your storage questions answered here. What does our storage package fee include? Our storage package fee includes the box, tape, labels, pick up, storage for the one semester and the return of your belongings. We service both on campus and off campus students. Note: Bubble wrap is an extra cost. Select the the storage package that you want, select your school, and process your payment through our easy-to-use website. It’s simple! How many boxes will I need? Based on past student experience, we have created our “Humongous Box” program, which provides 48″ x 24″ x 28″ of storage space. This is the box package of choice for the large majority of our students. Select 1 of our 4 box programs. How do I get my boxes and packing supplies? When ordering, select one of the convenient Box Drop Off dates. Your order will be confirmed by email and your items will be delivered to you on Box Drop Off date. What is the Box Drop Off Date? The Box Drop Off Date is the day at each school that Door to Dorm will hand out boxes, tape, and labels to customers who have ordered online. Where do I get labels for my boxes? We provide all labels already adhered to the boxes. All you have to do is fill them out. Yes, each storage customer automatically receives $250.00 of insurance. May I store stuff that won’t fit in a box? Yes, we can! Items that can’t fit into a box such as skies, lamps, bicycles, futons, couches, rugs etc., have a custom pricing schedule. Contact us for a quote for your oddly shaped items. We do not recommend storing food, currency, valuable electronics, mirrors, or any liquid items. Where is my stuff stored? All items stored with Door to Dorm are stored in our secure and insured warehouse, located at 570 Brook Street in Garden City‎, New York. Do you pick up and deliver off campus? Door to Dorm can service both on campus and off campus students. Non-dorm building deliveries include a $50.00 delivery fee and for buildings without an elevator, each additional flight of stairs includes an extra $50. Do I have to be there when you pick up and drop off my stuff? You may have a friend or roommate available, though we must be contacted prior with the new contact’s information. What if I have more or less stuff than what I ordered? No problem. You will only be billed for the amount that you store. Remember, there is no minimum or maximum amount a customer can store. Though our delivery drivers carry extra boxes, they may not always have the size you need. Always order more than what you need. It is quicker to get a refund than get new boxes in the right size. Are there maximum weight limits for the Door to Dorm Programs? Yes, see each product for the maximum weight limits. Each additional pound is billed at $2.00. Each box is weighed in the warehouse. May I pull my stuff out of storage early? Yes, you can. Contact us to request an early delivery. Please note that there is a pull fee of $25 and a $50 delivery fee. The earliest that you can get your stuff back without an additional fee is the first day of drop offs at your school. May I store my stuff for longer if I go abroad or take a semester off? Yes, we have semester storage or exchange storage programs. Just select multiple semesters, or extend your storage when placing an order. What if I don’t know my new dorm address or off campus address for the next semester? No problem! When we send our return confirmation email, let us know your new address. We accept all debit cards and all major credit cards including Visa, MasterCard, and Discover. We do not accept American Express. All payments processed online are secure, encrypted, and PCI-compliant. What if I don’t return to school and need my stuff sent home? No problem. 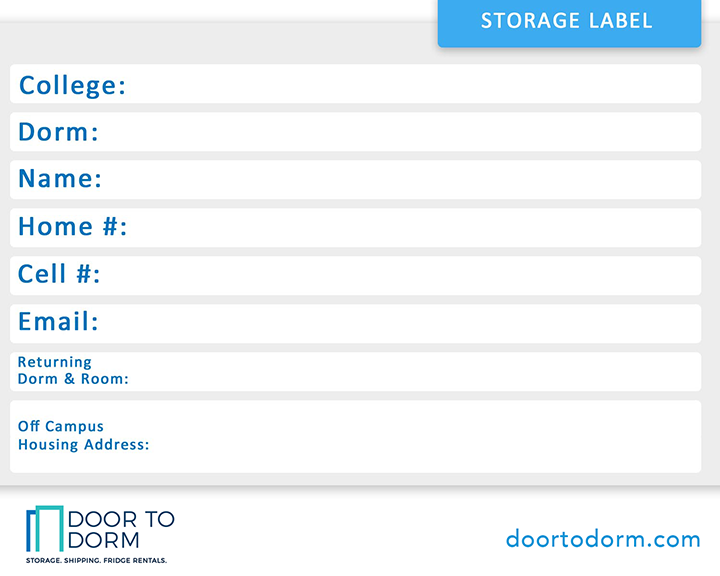 Door to Dorm will ship your stuff to wherever you need and charge your card on file for the shipping rates. Please note: Due to the size of our Humongous and Baby Humongous boxes, they can only be shipped via commercial freight rates. Door to Dorm has specific dates and times for box delivery day, pick up days and drop off days at each school. It is your responsibility to know if these dates will work for you at your school before you place your order. We also need the cell phone number of the person dropping off and picking up your storage items, whether it is you or a friend. What if I want to schedule outside of available delivery times? Door to Dorm has specific dates and times for box delivery. If you need to schedule a delivery time outside of the available time frames, you can do so for a $100.00 fee. Just call our customer service line: 1-800-883-8281. Your rental questions answered here. Do I receive my rental the day I move-in? And do I get to keep it until the day I move-out? On most campuses, we deliver prior to move-in and recover after move-out. This includes Hofstra, Fordham, Pace, Barnard (first years only), and Juilliard. For all other schools listed on our website, there are dates to choose from and those are your delivery dates (times included). Do I have to be present to take delivery of my rental? This depends. At campuses like NYU, dates & times are listed on the website. If you are unavailable, you can appoint a friend or a roommate to take delivery on your behalf. On campuses where we offer room delivery, students are not required to be present. However, please let us know prior to your delivery date. What if I miss my delivery/return? No-shows are automatically cycled into the next delivery/return. You will receive a call from our office advising you of your status and when we will next be on campus. If you miss the delivery date there will be a charge of $50.00 added to your credit card. What if my refrigerator stops working? Rentals are guaranteed for the term of the rental. Simply call our office at 1-800-883-8281 and Customer Service will take it from there. Most times we are able to replace defective units within 4-6 business days. You may also fill out a service request here. What about lost food or perishables? We are not able to reimburse students for lost food items due to mechanical failure. Many units can run for 20 years or more without any problem. So, while we are genuinely sorry for lost purchases, we cannot be responsible for manufacturing defects. If you cancel your order BEFORE it has been shipped, you will be assessed a $25 cancellation fee. If you cancel your order AFTER it has been shipped, you will be charged an additional $25 cancellation fee. Orders which are refused at delivery will be assessed all of the applicable fees listed above, including incurred shipping fees. Our credit card processing fee of $3.00 will not be refunded. Unfortunately, we are not able to make any exceptions. How much of a refund do I get if I cancel my rental after delivery? If a rental is returned within (2) calendar days, students receive a full refund less a $75 cancellation fee. After 2 calendar days, students are entitled to a partial refund depending on the length of the rental remaining. Your $25 security deposit is also refunded provided the rental is returned in satisfactory condition. Is the price for one or two semesters? The rental price for an Academic Rental is for two semesters. The rental price for a Semester Rental is for one semester. Can the MicroChill be purchased? Yes, the MicroChill is available for purchase. Go here to purchase a MicroChill. Your shipping questions answered here. What does the shipping fee include? Our shipping service fee includes one large box, tape, labels, and pick up of the box to be shipped. We service both on-campus and off-campus students. Please note: The fee listed does not include shipping fees. Shipping fees are an additional cost dependent upon the service chosen and the weight of the box. How do I make an order and pay? It’s simple. Go to our online store, select the type of shipping that you want, and pay online with a credit or debit card. How do I know how many boxes I will need? Based on past students’ experience, two large boxes (18” x 18” x 18”) are usually ordered. How do I get my box(es) and packing supplies? When ordering, select one of the convenient Box Drop Off dates. Your order will be confirmed by e-mail and your items will be delivered to you on your specified Box Drop Off Date. Please note: Free boxes and box drop off services are only available once you are at your school for shipping home, shipping abroad, and local student storage. Easy, we provide all labels on the boxes. What happens if my stuff gets lost in shipment? The shipping provider, such as UPS or FedEx provides insurance. If you would like to add additional insurance to your boxes, let us know, and we will add the insurance to your shipment. The cost of this additional insurance will simply be added to your invoice. Is it possible to ship stuff that won’t fit in a box? No, unfortunately, all items that are being shipped must fit inside of the box(es) provided. What happens with my stuff if I ship it from home, back to school before I return? Your belongings will be stored for up to 30 days before you begin the school year at our secure and insured warehouse in NYC. Then, your items will be delivered to your school residence at the beginning of the academic year. Do you pick up and deliver off-campus? We sure can. Door to Dorm can service both on-campus and off-campus students. Deliveries to off-campus housing requires an additional fee, which depends on how far you are from the school which you are registered. Call us at 1-800-883-8281 or 516-506-7718, or chat with a customer service representative online for more information. No you do not, but someone must be there to receive your order. Just let us know that person’s name and contact information so we can coordinate our delivery with them. Are there maximum weight limits for the Door to Dorm Box Package Programs? Yes, if using our large box, the weight limit is 40 lbs. with a $2 overweight charge for each pound over that limit. Each box is weighed at our warehouse. How do I cancel my shipping order? All orders can be cancelled without penalty up until 7 days prior to the first pick-up day at your school. If a cancellation occurs after this date, a $50 cancellation fee will be deducted from your refund. We accept all debit cards and all major credit cards including Visa, MasterCard, and Discover. We do not accept American Express. How much will shipping my boxes cost? Shipping prices depend on distance from our warehouse, weight and size of your box, and number of boxes. Use the zip code 11726. Door to Dorm will use the preferred shipping service of your choice, including the USPS, FedEx, or UPS. Door to Dorm has specific dates and times for box delivery day, pick up days, and drop off days at each school. It is your responsibility to know if these dates will work for you at your school before you place your order. We also need the cell phone number of the person dropping off and picking up your storage items, whether it is you or a friend. We’re here to help. Please feel free to fill our our contact form or call us at 1-800-883-8281 or 516-506-7718. We have customer service representatives available online to chat and answer your questions. Look for the chat box in the lower right hand corner of the website to see if we’re online right now to answer your questions.